Vevay Township’s Master Plan is a policy document that identifies how growth and associated land development should be guided to best insure the future welfare of Vevay Township. The plan concerns itself with long-range planning to guide and manage future growth and land use. The plan is not only a picture of Vevay Township today, but a guide to how the Township should evolve over the next ten to twenty years in response to growth and community aspirations. The Vevay Township Planning Commission, under the authority of the Michigan Township Planning Act, P.A. 168 of 1959 (as amended), prepared the Master Plan. The Master Plan is not a law or regulatory document, but a “policy plan” to be implemented through zoning and other regulatory tools. Although the Master Plan is not a zoning ordinance, the Master Plan’s recommendations and policies serve as a basis for updating the current Vevay Township Zoning Ordinance. In fact, the Michigan Zoning Enabling Act provides Michigan Townships with the statutory authority to adopt zoning regulations. The Master Plan addresses this statutory requirement and maintains a strong legal foundation for the Township’s zoning regulations. This plan remained in effect until 1992 when Vevay Township officials decided to prepare the township’s own Master Plan. Wade Trim, Inc. from Taylor, Michigan was retained to assist in writing the master plan. The Vevay Township Planning Commission held a public hearing on February 2, 1993. Six citizens, in addition to the Planning Commission, appeared to add the only citizen input. The Plan was adopted in March, 1993. The 1993 Plan noted that the largest land use in Vevey Township is agriculture. “Plans for the Township should include preservation of rural character as an important asset.” The Plan also called for a regular five year review of the Plan to ensure the Plan was followed. 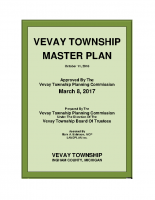 In early 2002, Vevay Township contracted with LandPlan of Okemos to assist in writing a new Master Plan. Five hundred people participated in the survey, open houses, and discussion with the farming community. The following is a general summary of the results of the survey. References to a “strong majority” means that at least 70% of the respondents share the same attitude. A strong majority of the respondents feel the Township is generally “rural” in character, that its current character is important in making the Township a desirable place to live, that they would like to see its current character continue in the future. A strong majority of the respondents feel the quality of life is high in Vevay Township and the following “generally” or “extremely” important in enhancing the quality of life: a) rural character/country living; b) schools; c) farmland; d) open spaces; e) police and fire protection services; and f) reasonable taxes. A strong majority of the respondents feel the preservation of farmland and other natural resources should be encouraged and support land use regulations intended to limit the encroachment of residences into agricultural areas. A strong majority of the residents feels the amount of commercial and industrial development in the Township today is adequate. The Planning Commission then used the results of the survey to assist in identifying important planning issues facing the community and establishing a set of goal and objective statements to address these issues and guide the policies of the Plan. The input received from the survey and the resulting draft goals and objectives, along with the other data collected about the Township, was then used to develop four future land use alternatives for consideration and discussion. The alternative scenarios addressed growth, development, and preservation interests, and the future location and character of agriculture and commercial, industrial, and residential development. Township officials sought the views of the public again in October and November of 2002 when it held two open houses. The open houses were held to give residents the opportunity to review the alternative scenarios and voice their preferences, concerns and suggestions. Based on the input received during the open houses, and from discussions with members of the farming community, official developed a particular strategy for growth, development and preservation. This strategy was then incorporated into a draft Master Plan document. After going through refinements, the draft Plan was made available to the public for review and comment. A Master Plan Station was established at the Township hall for a two-week period in June of 2003. The Station provided visitors with an overview of the draft plan, addressing factual data about the Township and the Plan’s principal policies. Complete copies of the draft Plan were also available for viewing. Visitors were encouraged to submit written comments on the draft Plan. Based in part on the comments received at the Master Plan Station, the draft Plan was further refined. Copies of the draft Plan were submitted to area communities for review and comment in compliance with the Township Planning Act. The Planning Commission formally presented the draft Plan at a public hearing in the spring of 2004. The Plan was finalized and adopted by the Planning Commission on May 5, 2004. The Planning Commission revised Master Plan and approved revised version on March 8th, 2017.